This report provides information on current pricing trends in the cannabis industry. 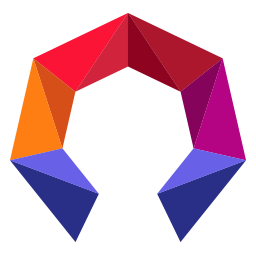 It covers overall price trends, with more detailed breakdowns based on categories, geographic locations, and demographics. It also offers breakdowns of price trends over time. The information provided here is based off Washington State sales data collected by Headset, and will provide you with a snapshot of price trends from one of the country’s longest-running legal cannabis markets. When it comes to cannabis, price matters. Whether it’s measuring the per gram price of legal cannabis against black market benchmarks, or examining the effect of economies of scale, the cost of cannabis is a hot topic. As expected, prices have dropped steadily in the legal cannabis market, especially as regulations have evolved to allow cannabusinesses to operate more effectively and truly take advantage of scale. While constantly dropping prices may seem like a cause for concern for some in the cannabis industry, that’s not necessarily the case. In order to outcompete illicit markets, the legal market has to undersell them. Currently, that process is still underway, and the more progress made towards that goal, the more cannabis consumers are converted to legal markets. To some extent, increased volume makes up for lowered prices. However, understanding price pressure within the current consumer base for legal cannabis is also vitally important, and this report breaks down pricing trends in a variety of helpful ways. Among the different product categories, for example, all segments except flower have experienced an overall price decline in the past two years. This isn’t what might be expected, as flower is the most commonly purchased category, but this could be explained by earlier price drops for flower products, or initially higher prices for categories that faced less direct competition from illicit markets. Broken down by gender, price sensitivity appears to be highest in women and among older consumers, although women tend to outspend men on edibles. Geographic price data is also interesting, as it suggests some price sensitivity based on a store’s location — rural, urban, or somewhere in between. 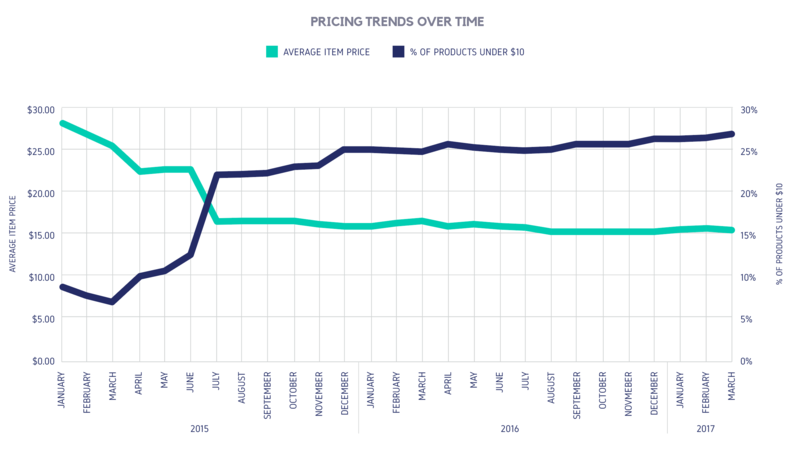 However, geographic data on markups shows that while some stores hit lower price points overall, that doesn’t mean they’ve lowered their markup very much. 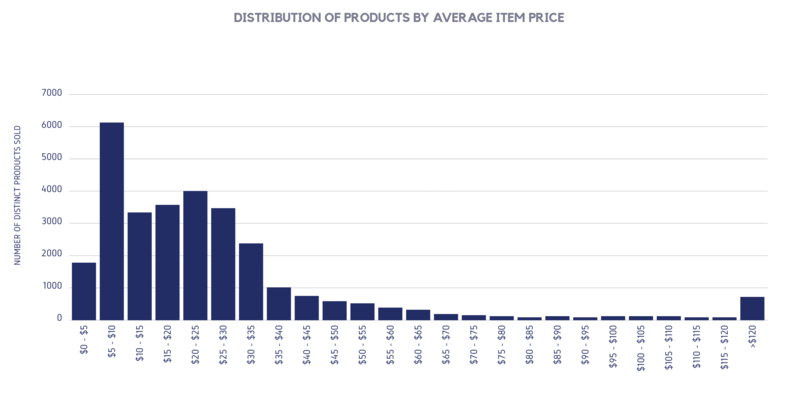 The majority of average markups by store fell within a relatively small range. This report also offers some interesting data on consumer stratification, with our pricing data for the high and low end of the market suggesting that the market is actually beginning to have a well-defined high and low end. Most importantly, the data suggest that consumers on those ends of the spectrum behave differently in terms of price sensitivity. The data in this report offers solid, actionable information on consumer price tolerances and industry price standards, and will allow industry professionals from any area to tailor their offerings accordingly. Pricing trends have much to tell the industry, both about how well it’s succeeding at its broader mission of supplanting the black market, and about how best to serve its existing consumers. Data for this report comes from real-time sales reporting by participating Washington State cannabis retailers via their point-of-sale systems, which are linked up with Headset’s business analytics software. The report below uses data for sales in the state of Washington. That data is cross-referenced with our catalog of over 0,000 products to provide detailed information on market trends. Unless otherwise noted the month in consideration is February 2017. Unless otherwise noted products without a size attribute in our database were excluded for analysis and infographics based on weight. As was widely predicted, prices have steadily declined over time. Since 2015, average item price has dropped nearly $15, while the percentage of items priced under $10 has risen about 20%. The trend has slowed in recent months, but every month besides December in 2016 had a lower average item price than the previous month. December stayed stable at $15.30, up very slightly over November’s average of $15.22. That range seems to be something of a plateau, as average prices in 2017 have remained between $15.20 and $15.30. Much of the price drop can be traced to the rapid introduction of new products at lower price points. Clearly, given the higher percentage over time of products priced below $10, suppliers are introducing new products at low price points. Indeed, many successful brands have launched economy brands after their initial success, hoping to capitalize on the bargain market. For example, Seattle area cannabis processor botanicaSEATTLE, after establishing their SPOT line of edibles in the Washington market, launched Journeyman, a brand specifically aimed at consumers on a budget. The sharpest growth in price point product offerings was in the first half of 2015, when they went from a little under 10% of the total market to over 20%, but they’ve grown steadily since. Over 25% of products available starting mid-2016 were in the under $10 range, creeping up toward 30% towards the end of Q1 2017. Looking more granularly at item price, we can see that the largest percentage of products sold in February of 2017 were priced between $5 and $10, making up about 20% of total sales. The vast majority of items were priced below $40. The decline in average item price is seen in almost all categories with the exception of Flower (which saw a modest gain in prices) and Topicals (which experienced a rapid increase in prices between Feb ‘16 and Aug ‘16). This could be due to the popularity of Topicals among later adopters of legal cannabis, specifically older consumers who use them for aches and pains. Flower is and always has been universally popular, and would thus be most likely to see price stability before other categories.